It’s safe to say this is a home on a property unlike any other. This cabin is located at the base of the Delphi Falls Waterfalls, outside the upstate town of Cazenovia. 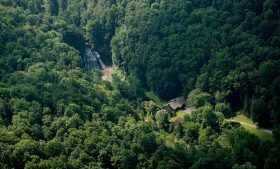 The property encompasses 60 total acres, with 65-foot and 52-foot falls as well as one mile of creek frontage. The same family has owned it since 1961, and just listed the whole shebang for $925,000. (The main home, with land easements, is also available for $699,000.) As broker Michael Franklin puts it, buying this would be “like owning your own state park.” We agree—this is the property for a New Yorker looking for an escape from just about everything to a completely nature-packed retreat.